Kankalitala is a temple town near Bolpur subdivision of Birbhum district in West Bengal. It is located about 9 kilometers (5.6 miles) from Bolpur on the Bolpur Labhpur road. It is situated on the bank of the river Kopai. It is a gram panchayat under Bolpur Sriniketan block. It is one of the ShaktiPithas where the waist (or kankal in Bengali) of Parvati fell. There are several temples in the town. Kankalitala is a sacred place where one can find peace and purity in the soul. In ancient time the place is known as Kanchidesh. In this temple, the symbolic stones of Goddess sati are submerged in the Kund ( a small holy pond) just beside the temple and the portrait of Goddess Kali has been worshipped in the room of the temple. The water of the kund never gets dried. It is said that the sacred Kund of holy water is internally linked with Manikarnika ghat of Kashi. The holy water is used in rituals in worshipping. Like other saktipith Ruru Vairab temple is just near the temple. 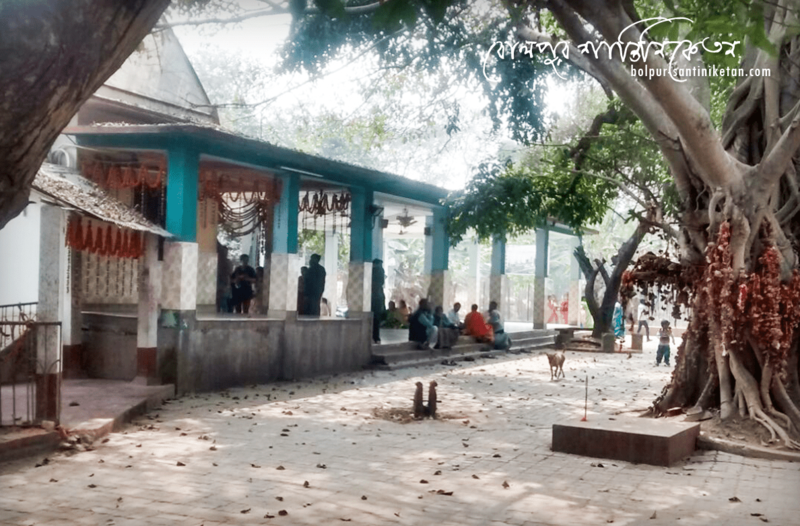 There is a Banyan tree which is known as “Kalpabriksha” in the temple courtyard. It is said that Mahadev and Devi stay together in the tree. People come here and make a knot with a red thread to a stone and hang it to the tree for fulfilling their desired wish. After completion of their desired wish, one can open any of the thread. When river Kopai is flooded with water, at the time the temple is also submerged in water. During those time the portrait of Goddess has been shifted to the nearby Shiv mandir. Every day at about 12 at noon “puspaanna ( one kind of Polao)” with five kinds of fried vegetables and “Paramanna” ( Payes) served to the Goddess. After serving the “Vog anna”, the propitiousness served to the visitors who want to eat “vog”. One best thing about the place is there is no such crowd and delicacy in the worship of goddess. There are no bounds if anyone wants to spend the whole day in the temple courtyard. Besides the holy temple, the place is also known for the local picnic spot. People who visited Bolpur-Santiniketan should visit Kankalitala once at least. Another attraction of the place is that Bauls, a group of folk singers sing and play melodious flute which melts all our emotions.